Are your students needing support with making connections between illustrations and comprehension? 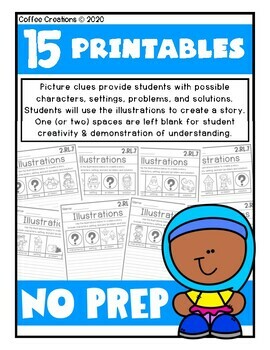 Are you looking for easy to no prep ways to encourage your students to utilize illustrations in the best way possible? Then look no further! 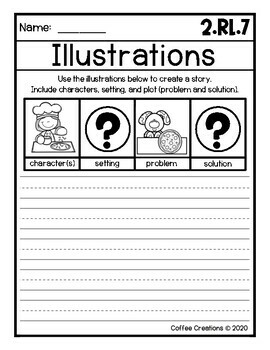 → 15 Printable Pieces - Picture clues provide students with possible characters, settings, problems, and solutions. 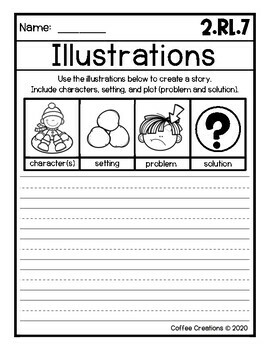 Students will use the illustrations to create a story. One (or two) story element spaces are left blank for student creativity and demonstration of understanding. Great for a writing center, as morning work, seat-work, homework, and/or more! 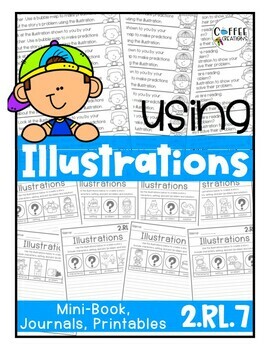 → Reading Illustrations Mini-Book - 30 total pages (2 per page for easy copying and assembly) for you to mix and match what is best for your students needs! Use pages whole/small group and even as exit tickets if desired. → 8 Journal Prompts - Printed 7 per page for easy copying. Use at centers, as seat-work, classroom discussion starters, an assessment of understanding, and/or more! Print on brightly colored paper (if desired) for an extra pop. Be sure to check out the PREVIEW for a closer look! Like it? Love it? Be sure to let me know! By providing feedback and a rating, you earn TPT credits towards any future purchases! Have a question? Product not displaying properly? Leave me a comment in the Q/A section before providing feedback! I'm more than happy to help in any way!